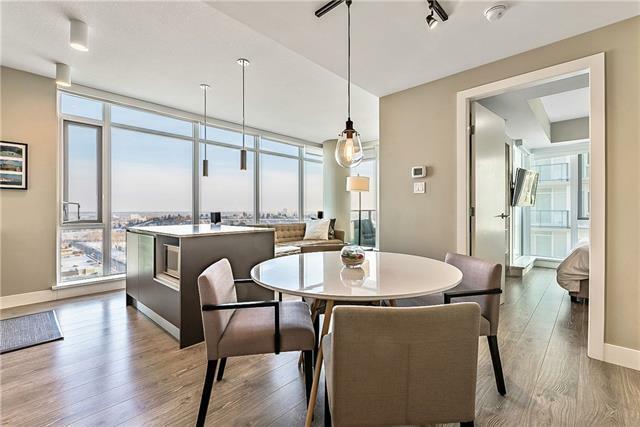 BRIGHT & OPEN with Amazing VIEWS of BOW and ELBOW Rivers, Downtown, Saddle Dome & Mountains from this 17th Floor, 2 Bed (MASTER is big enough to fit King Size Bed), 2 Bath Unit in THE GUARDIAN. Dramatic Floor-to-Ceiling Windows. Entertain in the stylish yet functional kitchen with cabinetry manufactured in Italy by Armony Cucine, high-end Appliances, QUARTZ counter tops & under mount sink. 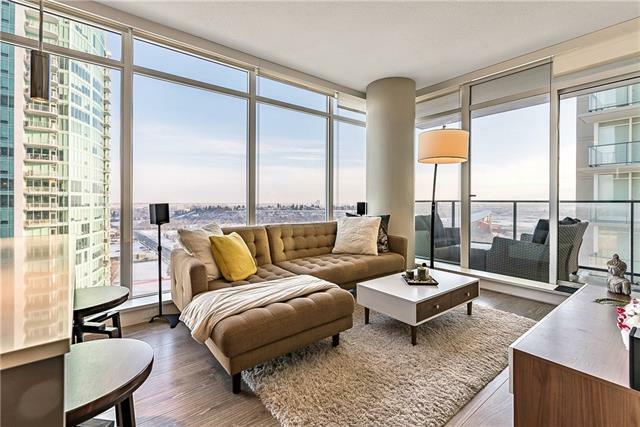 Large & open floor plan is great for entertaining leading out to 1 of 2 large balconies with ample seating space. Enjoy Summer BBQ & view nightly Fireworks during Stampede. Builder upgrades include Custom Built wardrobes in both bedrooms, room darkening & privacy blinds in Master. 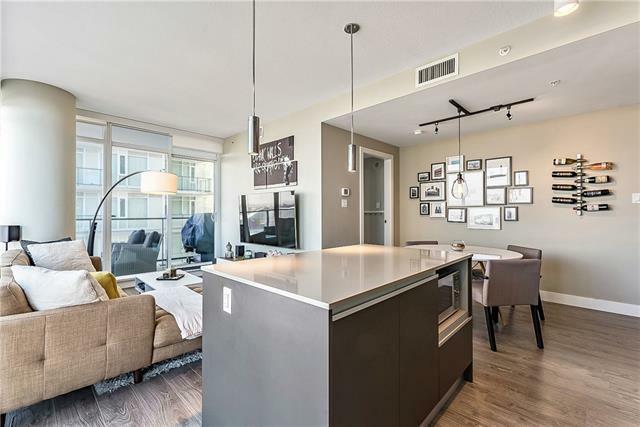 This Super clean & well-appointed unit comes with in-suite laundry, separate storage locker & titled, heated parking stall. Amenities include Concierge Desk, Security, very well equipped Social/Party Room, Workshop, Gym, Yoga Studio & Garden Terrace. 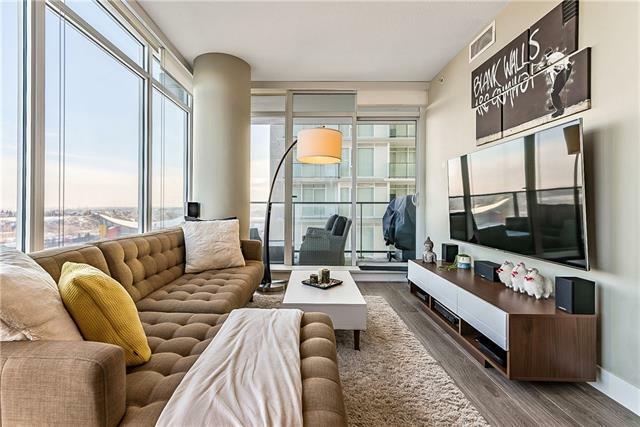 Walk or Bike to work - live right in the middle of the entertainment district. Listing provided courtesy of Maxwell Canyon Creek. © 2019 CREB®. All Rights Reserved. Data supplied by CREB®’s MLS® System. CREB® is the owner of the copyright in its MLS® System. The Listing data is deemed reliable but is not guaranteed accurate by CREB®. The information provided is for consumers’ personal, non-commercial use and may not be used for any purpose other than to identify prospective properties consumers may be interested in purchasing. The trademarks MLS®, Multiple Listing Service® and the associated logos are owned by The Canadian Real Estate Association (CREA) and identify the quality of services provided by real estate professionals who are members of CREA. Used under license. The trademarks REALTOR®, REALTORS®, and the REALTOR® logo are controlled by The Canadian Real Estate Association (CREA) and identify real estate professionals who are members of CREA. Used under license. Data last updated: 2019-04-19T18:29:34.903.